Hi Fiona, can you tell us a bit about yourself? Well, I am a ‘working mum’ of two teenage kids – Harry who’s 16 and doing A/S Levels and Samantha who’s 14 and beauty and fashion-mad! I have a lovely, very patient husband and a very naughty Golden Retriever dog called Gemma. How did you end up in the organic “beauty” industry? I have spent my whole career working in the beauty industry and for some of the ‘big players’ such as Estée Lauder, as I have always been passionately interested in beauty products. So, it was an obvious thing for me to develop my own range which also dovetailed into my interest in natural and organic ingredients. A lot of previously “high-powered” women are increasingly giving up their lucrative careers in order to get involved with organic products at the moment; do you have any thoughts on why that may be? I think it’s because, as a mum, you are always so concerned about what you feed your children or what you put on their skins. So you start to question all the previously received wisdom and want to have better, greener, healthier products for the whole family. How did Amie come into being? natural products for her to use, and, when I couldn’t find any that were good quality but affordable, I decided to create my own. What are the philosophies behind Amie? Really, it’s about creating excellent products that deliver what they promise and using only the best, natural and organic ingredients that we can find. We also want to make Amie products affordable and keep our prices under £5 as not everyone can afford the pricey upmarket brands. We also hate anything to do with animal testing and want products to be vegan and vegetarian friendly. Well, all of the above plus the fact that it was created for a real person – Samantha. Who are you targeting the Amie brand at? Everyone ! From women in their early teens upwards – we have many, many happy customers who are in their 20’s, 30’s and 40’s. 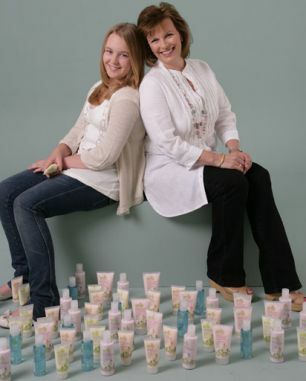 Amie is all about effective cleansing and moisturising using high quality natural ingredients and no nasty chemicals. What do you hope is in the future for Amie? Just to create more and more products ! I get requests every day for new products and I love developing them – so, just watch this space !! I always cleanse my face – morning and night ! I use our Amie Morning Clear Facial Wash without fail, as I still have combination skin and need to keep it clean (but not stripped). Then I use a light moisturiser, Amie Morning Dew Matte Finish Moisturiser – obviously – as my skin can get shiny and I need a shine control product. I nearly always wear makeup and cannot live without black mascara ! What is one cosmetic product couldn’t you live without? My Amie Bright Eyes Gentle Eye Makeup Remover as I use mascara every day and always take it off before I go to bed. So I needed a very gentle but effective eye makeup remover and Bright Eyes is the best ! What advice would you give Get Lippie readers? Don’t forget to take great care of your skin ! Sounds obvious but many women spend hours and hours on their hair, makeup and nails but forget to make much effort with their skin. Awwh, she sounds really sweet. And I love her philosophy too, she seems like one of the people truly dedicated to going green, rather than doing it to make money or look good as a company.